Fencing has been around for years. Before the U.S. population grew by leaps and bounds most fencing was used to protect herds of cattle and other livestock from escaping or being stolen by other people. Out of the American “dust bowl” in the 1930’s came the American invention of barbed wire. It is still in use today but other fencing structures have been designed for protecting dogs in typical American neighborhoods. Most fences are there foremost for the protection of the owners property from neighboring encroachment. The saying that fences make good neighbors is true! Ohioans go one step further with their down to earth Midwestern common sense- “The best neighbors are no neighbors”. Either way fences protect our property. Protecting dogs and other pets is top priority. Homeowners with dogs or cats use fencing to keep an animal from escaping. When an animal escapes they are prone to getting hit by a car or getting into a fight with another animal. Other disasters happen when dogs or cats are not confined to a homeowner’s yard. The ones mentioned just give you an idea of what can happen. Cats love to look down on everything. 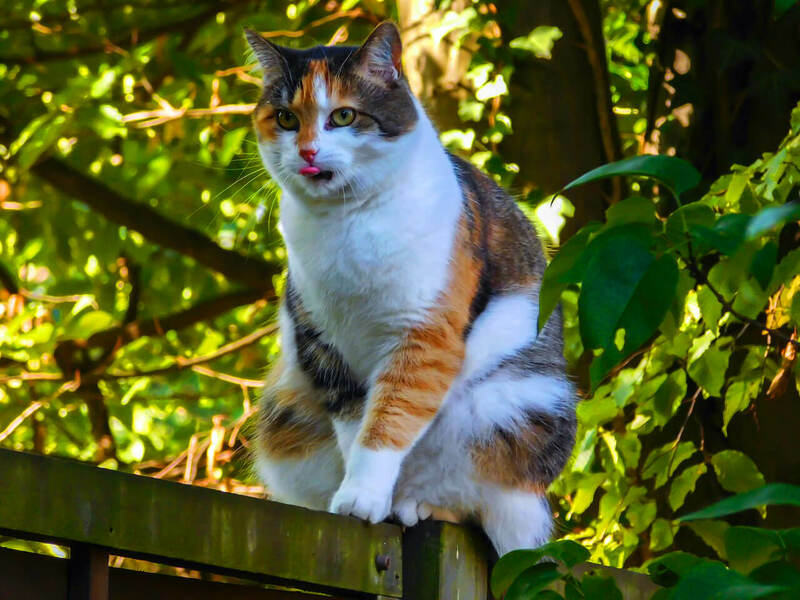 Sitting on top of a fence is akin to sitting on top of a refrigerator or top of a door frame. The worst type of fencing in use today is chained link fence. It has caused more injuries to animals then I can think of. Protecting dogs from harm can be accomplished by a myriad of fencing techniques. The most common fencing in the United States is: chain linked, wooden, concrete, vertical steel bar fencing, Invisible Fencing® and a live hedge. The types of fences that can be used for protecting dogs from harm vary from municipality to municipality. Various codes or homeowner’s association groups may dictate a certain type of fence that can be used on one’s property. They all have their pluses and minuses but they do all serve an important function- protecting dogs from injury or other harm. The height of the fencing is important if you own large dogs. Take a look at the German Shepherd standing on its hind-limbs in the slideshow above. That fence is way way to short. That animal could easily jump or climb over it. Protecting dogs from harm means keeping them confined in the yard without possibility of escape. Liability is also a problem if your pet escapes and bites a person. Chained Link- This is one of the most common types of fencing used for protecting pets. It is relatively cheap and readily available at hardware stores and big box retailers. Make sure you buy fencing that is taller than 4 feet if you have a big dog. Some of the major negatives are due to the sharp edges and hook like structures found on the fencing. 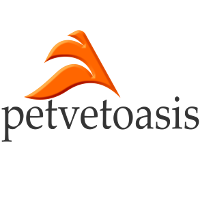 I have treated dogs that became impaled with the fencing penetrating the webbing of the paw. I have had clients cut away the fencing and brought the dog and the fencing into my office for extrication under a sedative. 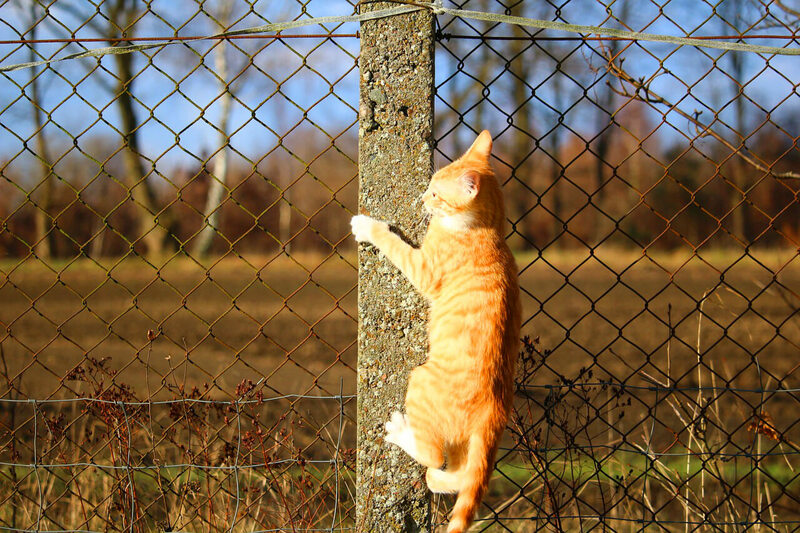 Jumping over chain linked fencing can also cause serious problems. I once treated an intact male German Shorthair that jumped a fence but its scrotal sac got caught up top as it was falling down on the other side of the fence. They didn’t want it neutered so I just did the laceration repair on the scrotal sac. Dogs love to dig. Just yesterday I noticed a 16 year old Basset Hound caught down low in the fencing. Half of its body was outside of the fence and the other inside. Fortunately I got a hold of the owners and we got the animal pushed back inside their property. Males will also penetrate a female in heat right through this type of fencing. Chain link fencing needs to be painted with aluminum paint or spray to look its best. Be careful though- this type of fencing is risky business. Natural Hedge- Hedges are beautiful and are all over the place here in Florida. Up north they are usually found in suburban or rural areas. Hedges make great barriers between homes that provide excellent privacy but you are going to have to combine the hedge with a hidden wooden fence for protecting pets from escaping the property. Many hedges are 10 feet tall. That height can hide lower wooden fences. Some hedges are dense enough to stop large dogs but small dogs can weasel their way past the roots and branches. 1 inch Vertical Bar Perimeter Fencing- This is an excellent form of fencing but an unsuspecting dog with the head of a “just right” size might get caught between the bars. If you do employ this method make sure beforehand that your dog’s head cannot fit between that space. This type of fencing is also quite expensive. 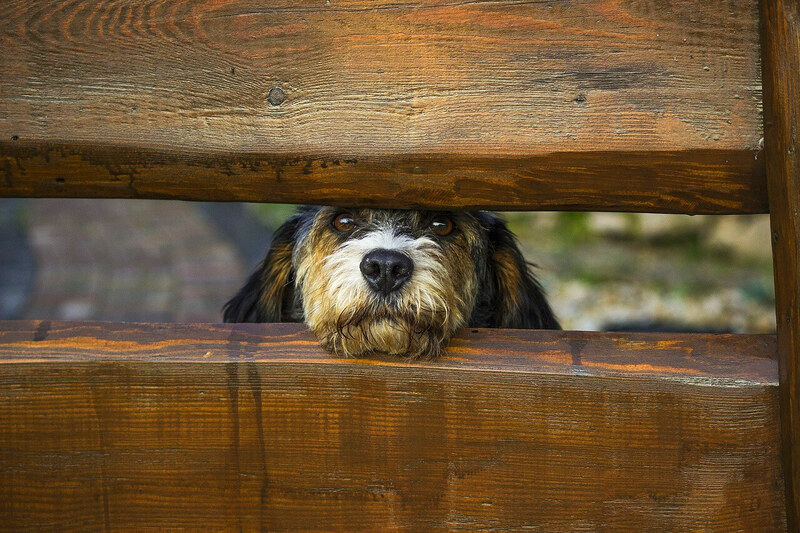 Wooden Fencing- This is an excellent type of fencing for protecting dogs from injury. Posts are dug deep and the vertical planks are place below soil level. This prevents dogs from digging under them. The big problem with wood is that it decays over time due to weather and sun exposure. Make sure to use treated lumber and apply an appropriate finish to the wood. Wood that is well maintained will prevent splinters and other sharp edges that could injure a pet. Concrete Walls- These are often employed in cities that demarcate the public sidewalk area from residential areas behind them. As long as they are well maintained concrete construction is fool proof as long as the height is adequate to prevent dogs from jumping over them. They are expensive to install. Invisible Fence®- This company has been around for a good while and installs underground wiring that is invisible to homeowners. It may be expensive but it is an excellent system that is designed for homeowner’s associations or other aesthetic reasons where above ground fencing is not allowed or wanted. A specially designed collar is put around the dog’s neck. There is training involved but the time is worth while. If you have a huge tract of land you can install it in just a small section of your yard. Just make sure you take off the collar before entering or leaving your driveway. A dog in the car will get a bit of a jolt if you do! Protecting pets with appropriate fencing saves lives. Just remember to pick the one that fits your lifestyle, budget and pet’s size.